Sphinx Simulator gives Wario a question to answer. Sphinx Simulators are machines that appear in Wario: Master of Disguise. There are two of them in the game, both found in the Smithsnorian Museum. Wario encounters them during Episode 3 while searching for the Pharaoh's three treasures for the Sphinx. When he finds one, he must use Sparky Wario's power in front of its plug to activate it. 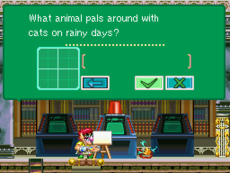 The Sphinx Simulator then gives Wario a riddle. The player must then answer the riddle by drawing each letter of the answer using the stylus. Answering the riddle correctly will open a passage, while getting the answer wrong will make him fall down a floor. There are a total of twenty riddles that the Sphinx Simulators can give, which are chosen at random. The answers to the riddles are all exhibits found in the museum. The riddles given by the Sphinx at the end of the episode are also taken from this list. This page was last edited on November 27, 2018, at 03:37.